A bit of Hollywood history unfolded on Wednesday. And it might be a glimpse into the future. 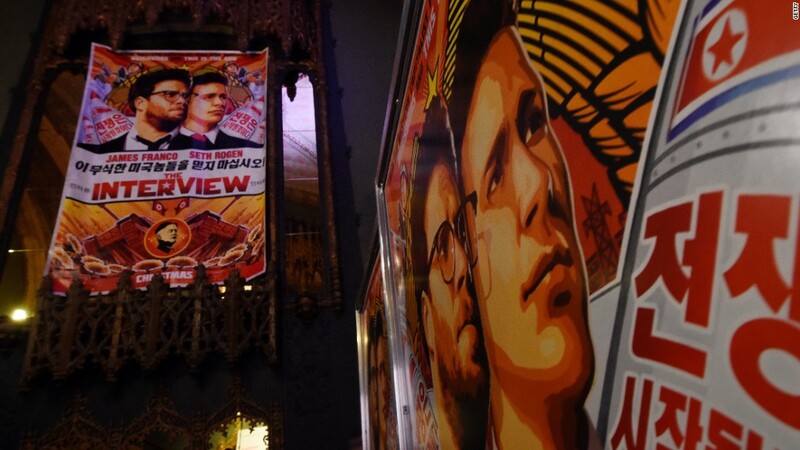 The controversial Sony Pictures comedy "The Interview" was released on YouTube, Google Play, the Microsoft Xbox video game console, and a special Web site. The movie, which started streaming online around 1 p.m. ET, costs $5.99 to rent and $14.99 to buy. So it is having historic simultaneous release in both living rooms and, come Christmas Day, about 300 independently-owned theaters across the United States. Sony announced the digital release just an hour ahead of time, after CNNMoney and other news organizations began to report on the studio's plans to distribute "The Interview" through YouTube's movie rental store. Word spread via social media, and some curious fans started watching -- and live-tweeting -- the movie right at 1 p.m.
Sony's extraordinary announcement encapsulated days of sometimes desperate negotiations between the studio and a number of potential Internet distribution partners. There was a plan at one point to allow rentals through Apple's iTunes store, but it fell apart, according to two sources with knowledge of the matter. An iTunes release could re-materialize sometime after Christmas. Sony (SNE) could also cut a deal with a subscription streaming site like Netflix (NFLX), enabling wider access to the movie sometime after Christmas. But at the moment, it's up on YouTube and generating an enormous amount of free publicity for the embattled movie studio, which fell victim to a cyberattack late last month. A Sony representative said the company would not be releasing any immediate data about the number of rentals or sales. The online release is groundbreaking -- but also awfully contentious. Owners of major theater chains have steadfastly opposed proposals for simultaneous physical and digital releases, a concept known in the industry as a same-day-and-date release. It's been tried, with varying success, for some documentaries and niche dramas, but never for a big, broad comedy like "The Interview," which was originally meant to premiere on 2,000 to 3,000 screens. But extraordinary circumstances call for extraordinary movie release strategies. This time last week, after hackers -- apparently objecting to the content of "The Interview" -- threatened American moviegoers, Sony canceled the movie's release. Sony Pictures CEO Michael Lynton told CNN's Fareed Zakaria that he had no choice because "the movie theaters came to us, one by one, over the course of a very short period of time ... and announced that they would not carry the movie." Some of the theater chains dispute that. But one thing is clear: that same day, December 17, Sony contacted Google (GOOGL), Microsoft (MSFT) and other potential online distributors. "We never stopped pursuing as wide a release as possible for 'The Interview,'" Lynton said in a statement on Wednesday. "It was essential for our studio to release this movie, especially given the assault upon our business and our employees by those who wanted to stop free speech." He added, "We chose the path of digital distribution first so as to reach as many people as possible on opening day, and we continue to seek other partners and platforms to further expand the release." One of the platforms is a dedicated site, SeeTheInterview.com, done in partnership with Kernel and secure payments system Stripe. But that site appeared to be overwhelmed by traffic shortly after 1 p.m. ET. Kernel acknowledged "tremendous demand" but said the streams were "free flowing" by 2 p.m.
Google's streams appeared to be more stable. Google senior vice president David Drummond wrote in a blog post that "security implications were very much at the front of our minds" when Sony contacted the company last week. "After discussing all the issues, Sony and Google agreed that we could not sit on the sidelines and allow a handful of people to determine the limits of free speech in another country (however silly the content might be)," he wrote. As for the physical release on Thursday, the studio's list of participating theaters includes about 300 that will start showing it on Christmas and dozens of others that will start showing it on January 1 or January 2. Some of the Christmas Day screenings are already sold out. "With what looks like a seriously limited release, limited supply is yielding substantial demand," the fan web site Moviepilot said. For Sony's partners, the digital release of the movie is an opportunity to show off technological and commercial prowess. YouTube, for instance, has a two-year-old movie rental system that many of its users don't know about; "The Interview" is chance to gain attention for it. The movie, oddly enough, became a political and geopolitical symbol. It is about an assassination plot against the North Korean dictator Kim Jong-Un. And it is widely believed that Sony Pictures suffered a cyberattack last month partly due to North Korea's fury over the movie. Backlash to Sony's original cancellation decision was fierce, including from President Obama, who said the movie studio had made a mistake. Since then, Sony executives have stayed in close touch with White House officials, appraising them of the studio's efforts to seek distribution. And on Wednesday, administration officials signaled that they were pleased with the theatrical and digital plans. Shortly after 1 p.m., the White House responded to reporters' inquiries with a statement: "The President welcomes the news that people will be able to decide for themselves whether or not to see this film, and appreciates Sony's work on this effort over the past few weeks." The statement added, "With today's announcements, people can now make their own choices about the film, and that's how it should be." Republican National Committee chair Reince Priebus concurred. In a followup to his Saturday message calling on theater owners to support the movie, he said the renewed Christmas release "was the right decision." Priebus added, "Anything else would set a horrible precedent and allow our freedom to be ceded to the whims of a totalitarian regime." --CNN's Pamela Brown and Michelle Kosinski contributed reporting.